In Vivaldi, you can set your default search engine to anything you like. After all, we’re all about giving you the freedom and flexibility to browse exactly the way you want. But choosing your search engines should not be taken lightly. With increased surveillance, security breaches, and poor privacy practices, our privacy is being eroded every day. Almost everything we do online (and offline for that matter) is being processed by algorithms. As a browser company (with our hearts in the right place), we are concerned and believe in giving our users the respect they deserve. That said, it all depends on the choices we make. Many of the tools that help us navigate around the Internet utilize tracking to “improve” user experience. More than two-thirds of websites contain hidden Google trackers, and one quarter have hidden Facebook trackers, according to Gabriel Weinberg, Founder &amp; CEO of search engine DuckDuckGo. If you don’t protect your privacy, your private data (such as search history) will be fed to algorithms which can become biased. They will not show you search results that are objective. They will show you what they think you are more likely to click on. Eventually, they’ll put you in a bubble (or silo) by showing you only things you agree with. At Vivaldi, we’ve worked hard to bring you several privacy-focused alternatives that protect you from surveillance, respect your privacy, believe in the neutrality of search results, and promote neutrality online in general. Since July 2018 we’ve collaborated with Europe’s leading search engine Qwant to allow you to search the web without being profiled. 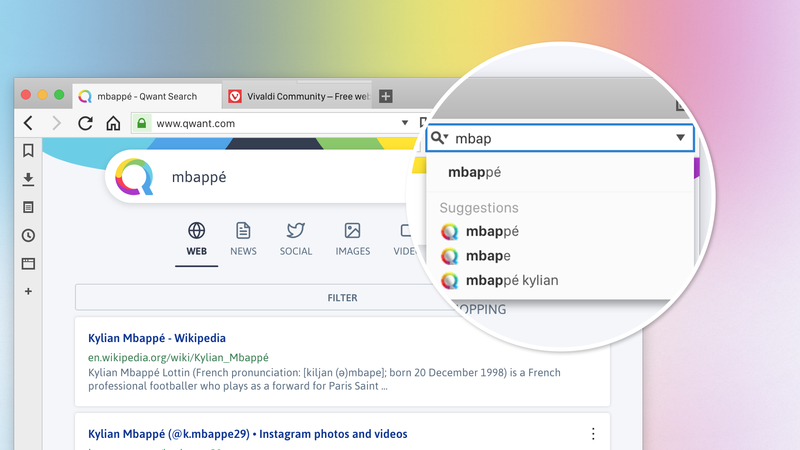 With Qwant, you will get neutral search results, e.g. two people searching for the same term will get the same result. 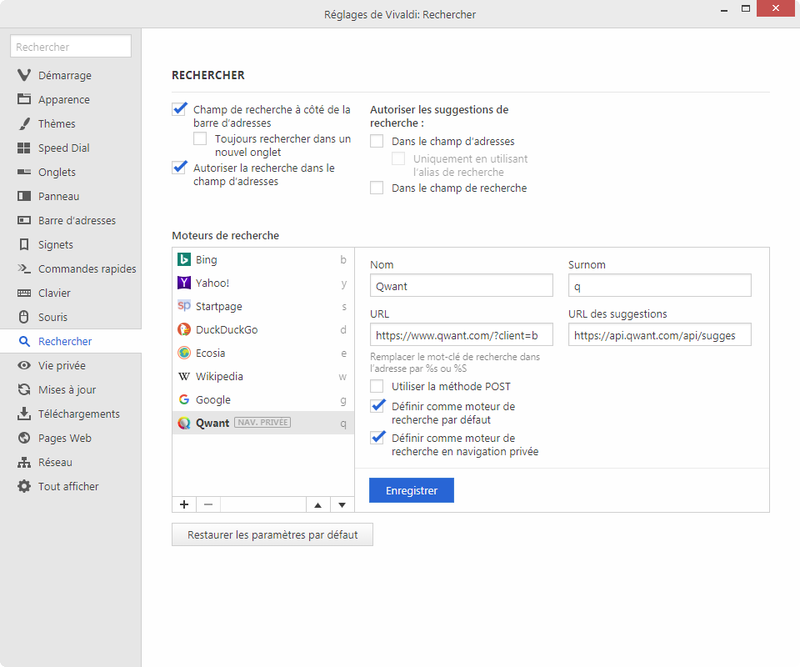 Qwant is also the first European search engine that is building its own web indexing technology. In many ways, Qwant echoes our own values here at Vivaldi – they do not track users, nor do they trade in private information. DuckDuckGo doesn’t track or collect any personal information on its users. Because DuckDuckGo doesn’t collect user data, it doesn’t base the results it returns on what the company believes “particular users would already agree with”. Since March 2018 we’ve been collaborating with DuckDuckGo to offer you a more private search experience. 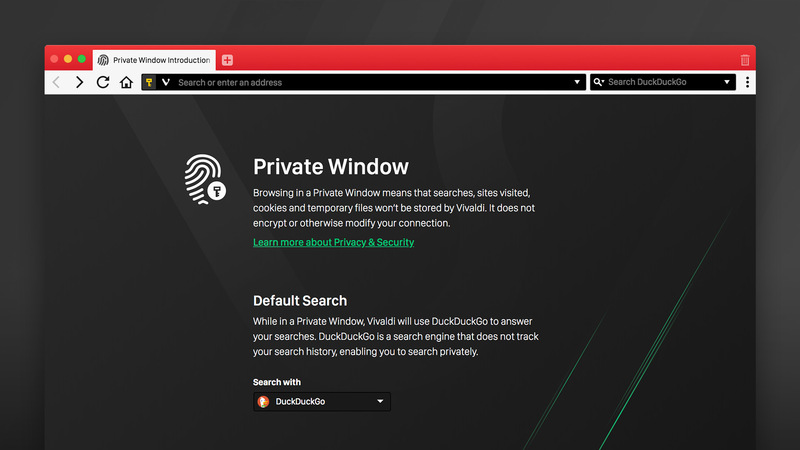 In fact, Vivaldi became the first browser to enable a default Private Search and to allow users to set a default search engine exclusively for Private Window browsing. When you search using DuckDuckGo, your search history is not tracked in any way. Browsing in a Private Window means that any websites you visit, cookies and temporary files will not be stored by Vivaldi. StartPage is focused on users’ privacy but in a slightly different way. StartPage utilize Google’s search engine but anonymize any tracking of user behavior. This means that users get the search results, without the search engine sending any personal information to Google’s servers. This search engine also doesn’t filter results based on past searches and online services used. StartPage has a third-party privacy certification by EuroPriSe. In April 2017, Vivaldi started partnering with Ecosia, giving the eco-conscious users easy access to a greener search engine option. As a result of this partnership, those of you that choose to search with Ecosia can turn your web searches into trees planted in the world’s most environmentally threatened areas. Ecosia donates at least 80% of their profits from search ad revenue to support tree planting programs around the world. Over a period of 12 months, Vivaldi users planted an astonishing 33,523 trees! And this tree count is rising every day. We're also working with search engines Yahoo and Bing. If they are your preferred search engines, they – along with Google – are available in Vivaldi by default. Much like other browsers, Vivaldi generates revenue from affiliate deals, and this includes search and select bookmarks. Every time you search using one of our search partners, you’re helping us grow, one search at a time. The only exception is Google – we don’t have a partnership with them. However, we know that some of you use this search engine daily, so we include it in Vivaldi by default. To switch between search engines in Vivaldi, simply click the magnifying glass button in the Search Field and select the one that you’d like to use from the drop-down menu. There’s even a quicker way – you can switch from one search engine to another by simply typing its nickname in front of the search term, followed by space. For example, if you type “e Vivaldi browser”, you will see the search results displayed by Ecosia (“e” being the nickname for Ecosia). You can change the default search engine nicknames in Settings, under Search. If you enable both “Show Search Field in Address Bar” and “Search in Address Field” in the Settings, you’ll effectively have two search engines at hand, without the need to use the search engine nicknames. You could use your default choice for searching in the Address Field and set another search engine for the Search Field. Easy! So, browse safe and think about the choices that will make an impact. Over to you. Which search engines in Vivaldi do you use the most? Are you concerned about privacy online or getting siloed? Or does the environment come first for you? Let us know in the comments!